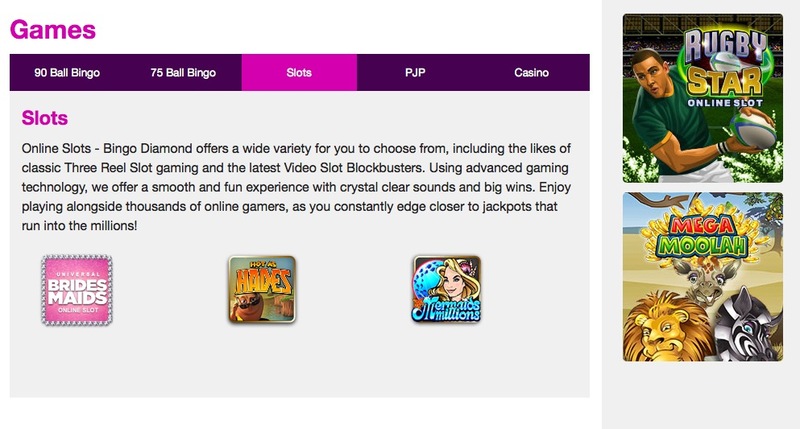 Bingo Diamond allow users to experience the thrill of bingo online, eliminating the need to travel long distances to find your nearest bingo hall. You’re offered a good selection of bingo that hosts 90 ball and 75 ball bingo. There is a variety of progressive jackpots on offer with tickets starting at just 5p. On offer for you to play here are slots, table games, video poker and instants. The list of titles is outstanding, game titles include: Isis, Spin Crazy and Triple Magic. You can play your favourite Bingo Diamond games on your smartphone with no downloading required too! Just head tot he site on your devices browser and hey presto! Bingo Diamond runs on the Microgaming software. There is no downloading necessary in order to play here. You can use the following payment methods: Click2pay, Ukash, Instadebit, Moneybookers, Neteller, Switch, Solo, Visa and Mastercard. Your details are safe and secure via SSL (Secure Sockets Layer) protocol. Bingo Diamond really pushes the boat out with its’ extravagant landing page, it’s rich in colour and loaded with offers and promotions to get you to play. Registration is easy with simple to follow instructions. When you arrive at the lobby you find it is laid out well, colourful and bright. Accessing the bingo rooms, you’re instantly met with a great bingo layout, a modern feel and a greeting from the chirpy chat host. You can play bingo, side games and chat at the same time if you wish. I really like this site, there’s fabulous promotions running and big jackpots to be won. Bingo Diamond is licensed and based in Malta.